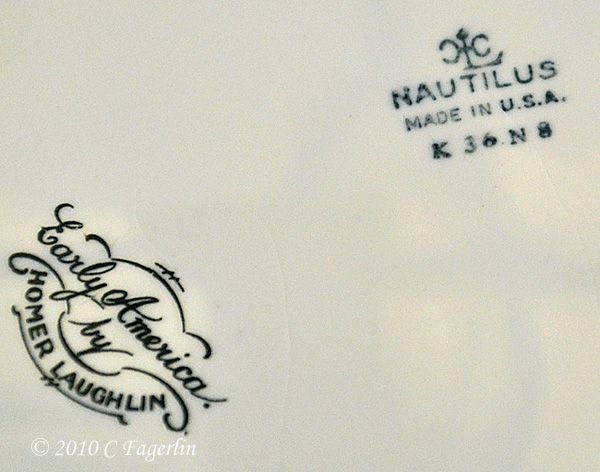 Homer Laughlin China Company has been in continuous business since the late 1800's, first in East Liverpool, Ohio and then right across the river in Newell, West Virginia. The company is probably best known for its Fiesta line of dinnerware, but over its many years of production it has produced thousands of different shapes and tens of thousands of decorations/designs on those shapes. 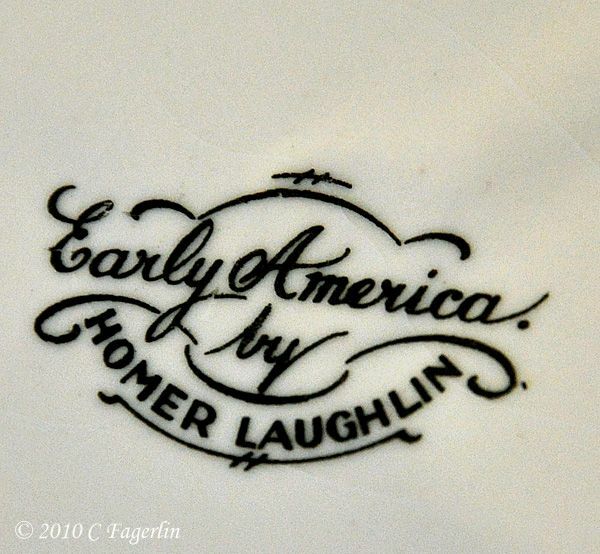 A few years ago I was very lucky to find a service for six in the "Early America"
easy to find and is coveted by collectors of Homer Laughlin dinnerware. 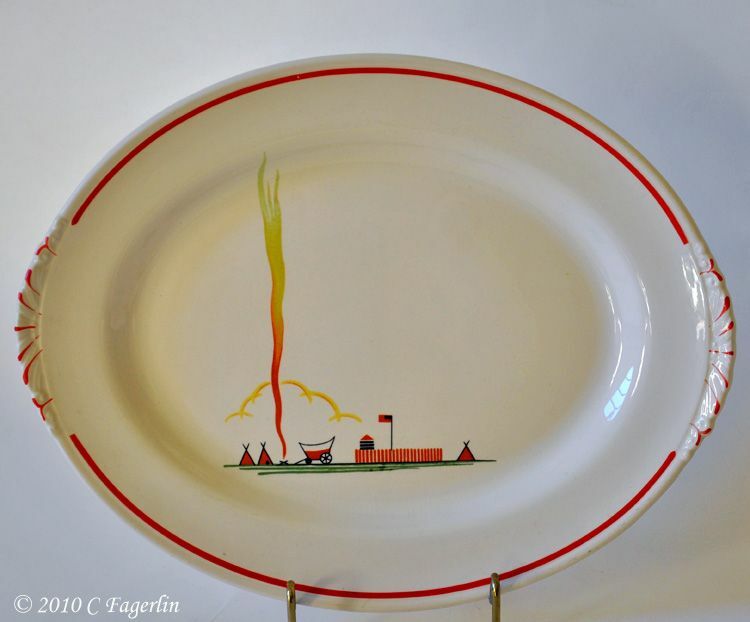 The decoration includes red striping and different modes of transportation in the early days of the United States. The set I found included a platter, serving bowl, berry bowls, bread and butter plates, dinner plates and cups with saucers. A few months after I found the set some dish friends found the matching creamer and sugar for me. 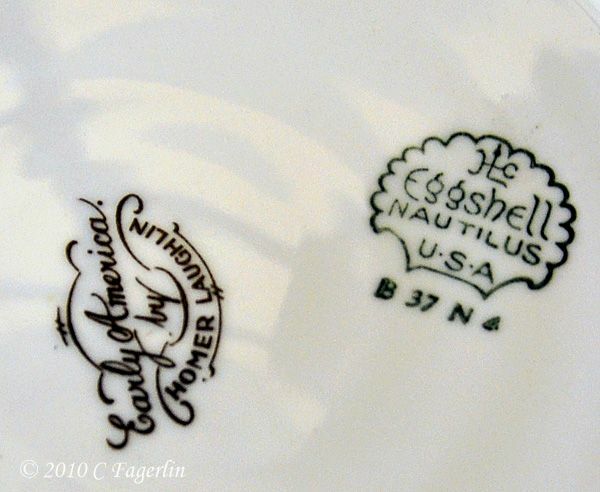 And during the intervening years I have picked up a couple of extra serving bowls and platters in the Nautilus shape, as well as some additional plates, cups and saucers in another Homer Laughlin shape with the same decoration. Note that the red stripe is different on this shape. 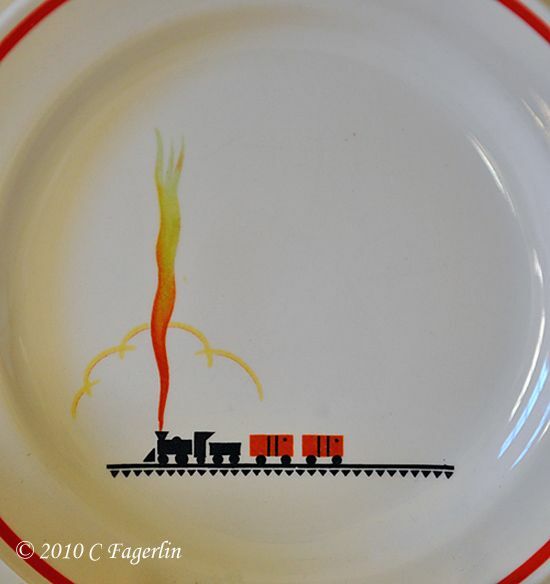 This set of china has appeared on TLRT in a tablescape. 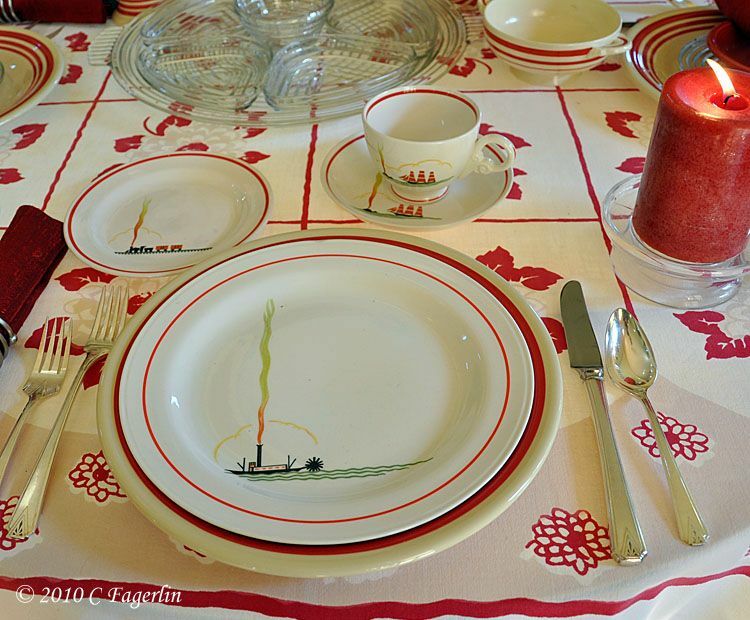 Click the image below to see more of the tablescape. 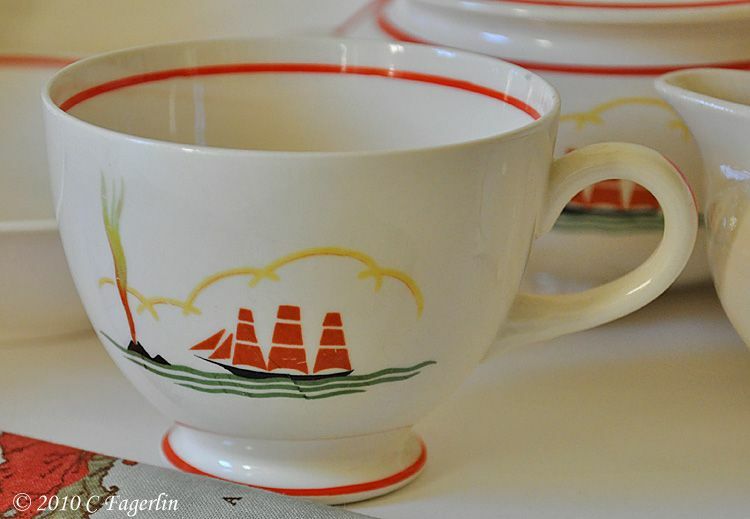 Thanks so much for stopping by to visit and see some more of my vintage dinnerware collection. I just found your blog through the Coloradolady and am so glad I did. What a great post! These dishes are so sweet and unique. They made me smile! And you have them set so beautifully. Really enjoyed this post! I've never seen dishes like that before. Very unique with the different forms of transportation. Your table settings looked very nice. That is so cute. I have never seen that line before. And I love the napkins! Oh wow these are so beautiful! I've never seen this line before. I love Homer Laughlin, and I try to collect them when I find them. These are really fun collections, and those napkins are perfect with them! That's an interesting pattern. I like the plain shape better. Extraordinary! I've never seen this pattern. You have a very prized possession with those dishes. They are priceless. Oh, boy! Seeing your vintage dishes has me wanting to run to my local thrift shop and sort through their stacks and stacks of vintage tableware! 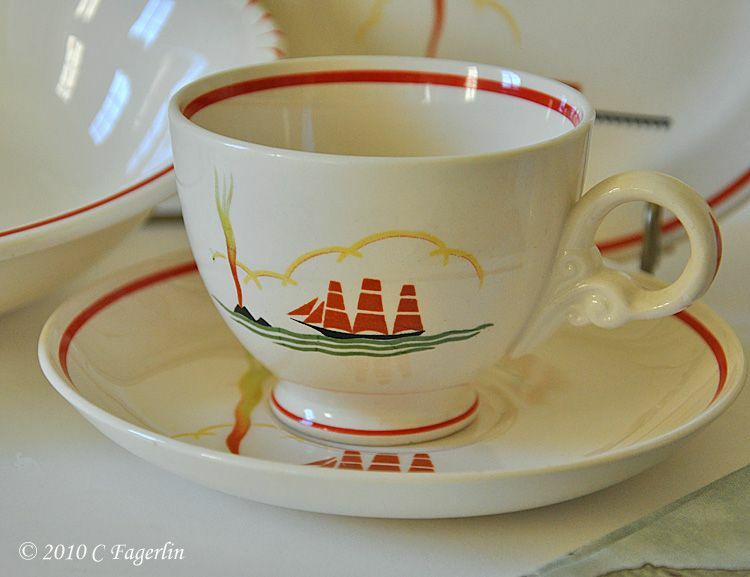 What a lovely set of china. I love the ships and trains. This set is such a treasure! How does it look on the 1850's transportation cloth? 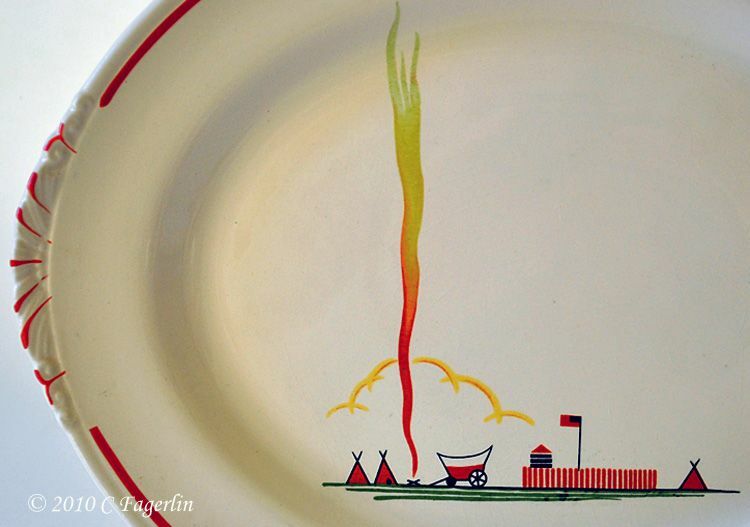 JDaniel would love all the forms of transportation illustrated on this tableware. I am in love with those dishes!! 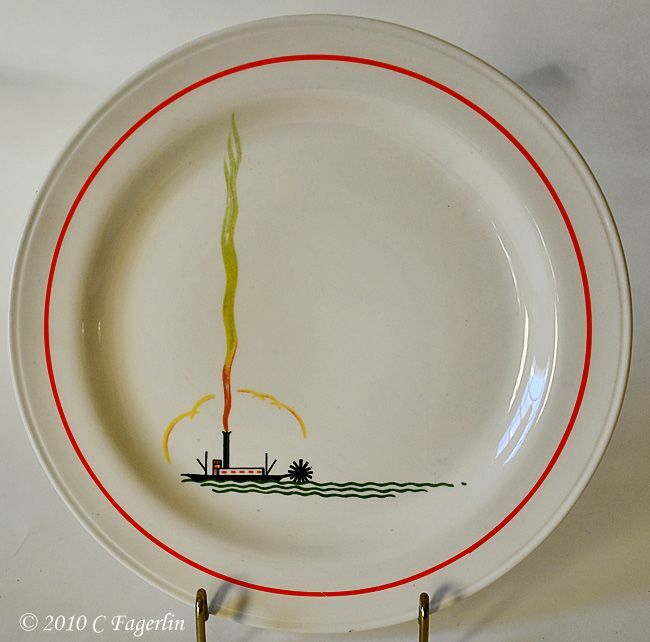 I love Homer Laughlin dishes. I've never seen this pattern! Amazing! 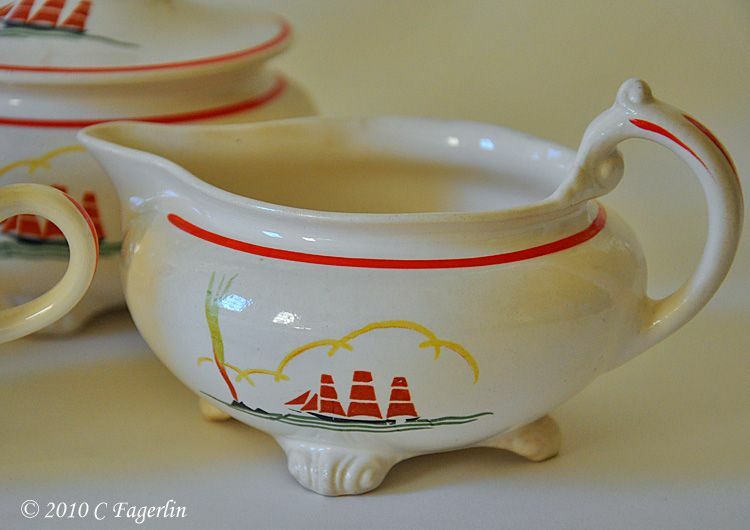 I come here and drool over your dishes and then run out to e-bay and find that I can't afford them at all! But I certainly love stocking my china cupboard vicariously in my imagination through your wonderful links to Alphabe-Thursday! I will totally grab them if I see them at a garage sale...along with those apple bowls of yours that I covet! Thanks for the wonderful, colorful and informative post today! I always love visiting you. You have no idea how this post made my day! I have the platter that my mom gave me for my birthday one year. I had no idea what the pattern was and have never seen a single piece like it. I thought maybe it was not real!!! I had no idea so many pieces were out there, now, I will really keep my eye open.....I so LOVED this post! Happy VTT! wonderful... 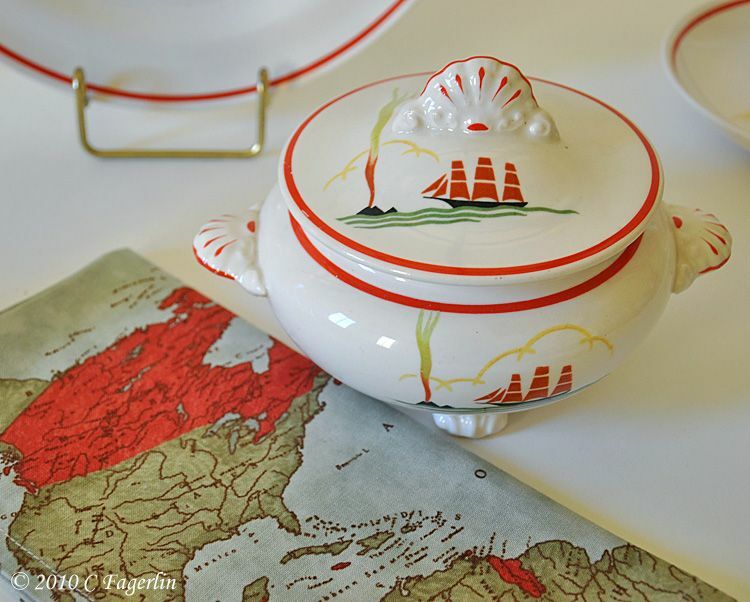 I love the simplicity of the the red lines and design... lovely setting! THS! 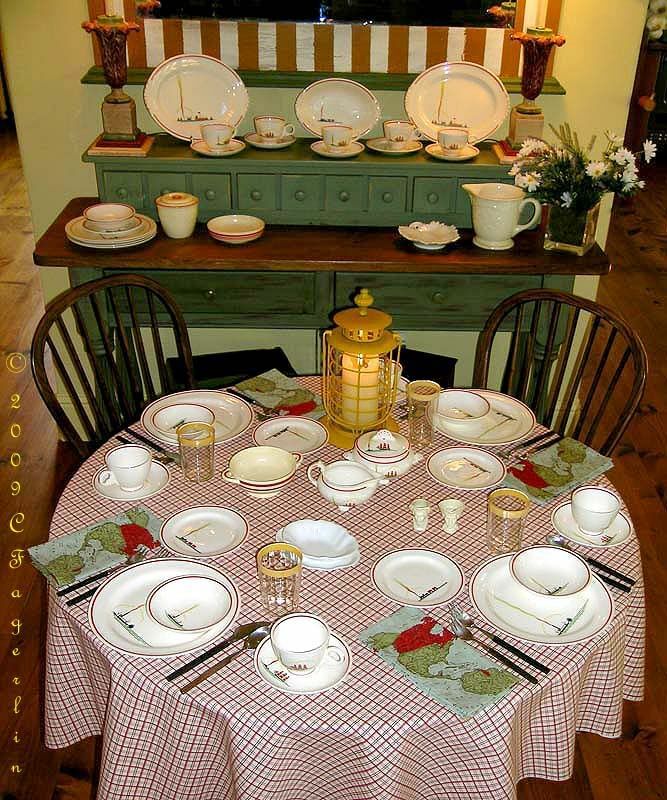 Whenever I see a tablescape I think of my Swedish grandmother "Farmor" who loved nothing better than to take the time to make a table special. I really love this pattern, especially the ship. 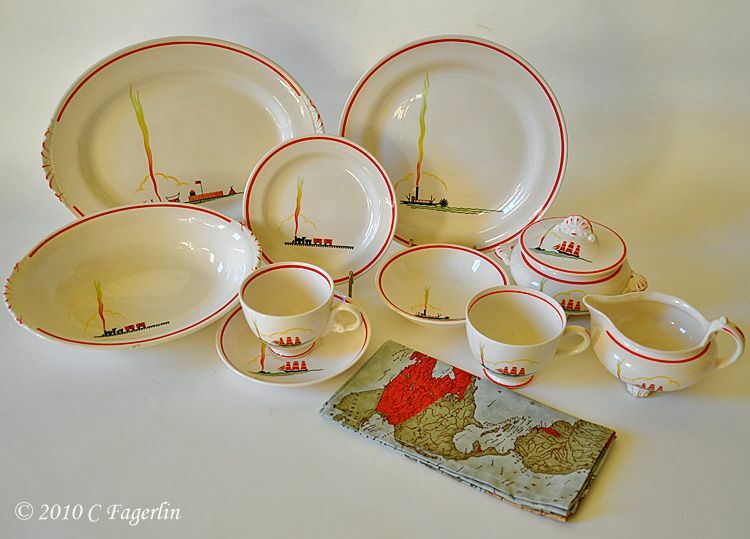 I've been blessed to inherit three of my Farmor's china sets. I cherish them. 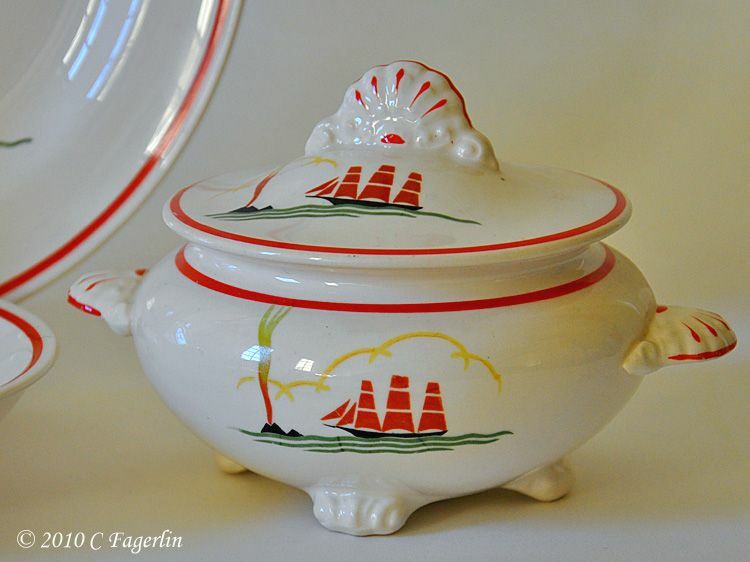 Great nautical dishes. Those look like they would be perfect in a lake home or for someone who has little boys. Even if they couldn't eat off them, I bet even they would appreciate something in the home decorating scheme. Looks like you really did get a great find! wow!!! 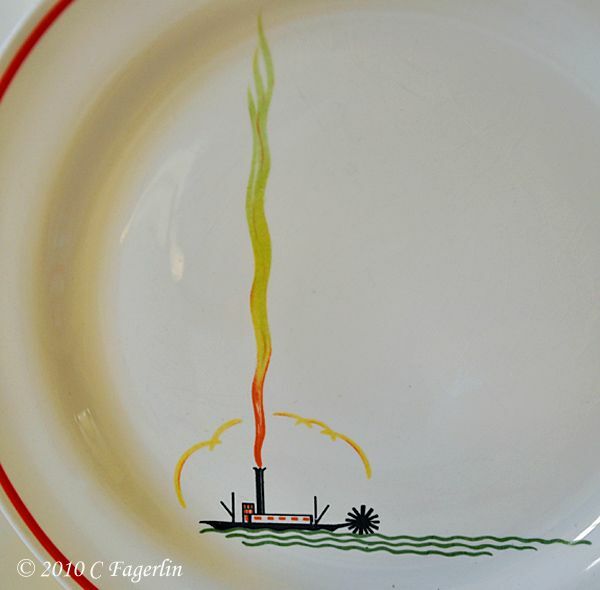 this is truly vintage dishes! so many of them your got and all looks good! thanks for sharing and have a great weekend! Love, love, love those dishes! I had never seen this pattern until now. Thanks for showing them. I've chosen you for the Stylish Blogger Award. Come by if you'd like to accept! Coloradolady! Well you made my day with your sweet comment! So happy that you now have an ID on your lovely piece. And do keep your eyes open, they are hard to find, but worth the hunt. I hope you'll all stop back again as I share more of my memories and collections .... I love hearing your stories. I haven't tried it on my "transportation" cloth yet, I think the colors may clash a bit, there's lots of orange in that cloth.